Ok, so it may not be all that southern, but I grew up in Minnesota. Polenta, greens, Old Bay seasoning...they are the furthest things from any pantry in our small midwestern town. Add olive oil to pan and heat. Saute onion and celery a few minutes until tender. Add shrimp and mushrooms and saute a few minutes, then add chard and seasonings. Meanwhile, cook polenta as package says. When polenta is thick, stir in butter and honey. Plate polenta and top with shrimp and veggie mixture. I sprinkled a little cojita cheese on because, well, everything tastes better with a little sprinkle of cheese. We paired this with the 2004 Rutherford Hill Merlot. It wasn't my first choice of what to pair with the shrimp, but it went rather well. The sweetness of the honeyed polenta mirrored the jammy berries and vanilla undertones. It had just a hint of spice, which was complemented by the dash of chili powder that went into our meal. While it was good,I'm not sure if we'd get this merlot again, as at the price point of $25, we were expecting a bit more. That looks wonderful. Sigh, I so envy those that get seafood at home. I really like the Rutherford Hill Merlot too. I hadn't thought of it with seafood, but it makes sense with the polenta that it would be really good. Thanks for the idea! Kudos to you for pairing shrimp with a Merlot! Many wouldn't have thought of it, & honestly, I'm not sure I would've, either! I also have enjoyed the Rutherford Hill, but I do know that you can pick up a really good Merlot for under $25, too, so I understand your hesitation to get it again. Look at the size of those suckers! Sounds like an amazing on-the-fly dinner! Nice. The size of those shrimp are awesome too. You've been tagged! Come see my blog for details. 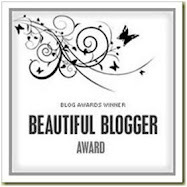 I left the Kreativ Blogger award for you on my site. Have a great day!